β0ToxinA® (Botulinum Toxin Type A for Therapy) is a sterile, freeze-dried form of purified C. botulinum toxin type A produced from the crude toxin of the culture of the Hall strain of Clostridium botulinum grown in a medium containing trypticase and yeast extract. A series of purifying procedure were taken to form a crystalline complex form consisting of active high molecular weight toxin protein and an associated hemagglutininin in a gelatin-dextran-sucrose substrate. To reconstitute, it should be diluted with sterile physiological saline. The solid white product then dissolves into a transparent colourless to yellowish solution. One unit (U) of β0ToxinA® corresponds to 1 LD50 of (rodent) intraperitoneally-injected Botulinum Toxin Type A.
Botulinum toxin type A has been the subject of scientific investigations for over 100 years. In the '60's, its muscle-relaxing properties were studied for treating a variety of conditions caused by overactive muscles. It was first approved by the U.S. Food and Drug Administration (FDA) in December 1989, to treat two eye muscle disorders (blepharospasm and strabismus), and in 2000 to treat cervical dystonia. As a side effect of the eye disorder treatment, doctors observed that it softened glabellar lines. By April 2002, the FDA was satisfied by its review of studies and approved it for aesthetic and cosmetic use, specifically "to treat and temporarily improve the appearance of glabellar lines." However, it had been used "off-label" for over a decade before that, to treat facial wrinkles as reported in several open label studies ("Off-label" or unapproved use is supported by the FDA as long as the practice is grounded in good science). Cosmetically, it is the only product of its type that has been used for over 10 years in thousands of patients in 60 countries worldwide. Moreover, Botulinum Toxin Type A has been recognized as a valuable treatment by the American Academy of Neurology, American Academy of Ophthalmology, and National Institutes of Health. β0ToxinA® is provided as a vacuum-dried, crystalline preparation packaged in glass vials of one hundred units each, which are stored in the freezer (at 5° C) and must be reconstituted before use. Each vial of β0ToxinA® contains 100 units (U) of C. Botulinum toxin type A, and a gelatin-dextran-sucrose substrate made up of 5 mg gelatin, 25 mg dextran, 25 mg sucrose. At the recommended dosage, and when correctly injected intradermally in patients with no particular neurological or neuromuscular disorders, β0ToxinA® is not absorbed into the system and therefore is not expected to be present in the peripheral blood at measurable levels. Therefore no overt distant systemic clinical effects should be caused. β0ToxinA® or botulinum toxin type A, is a purified protein produced by the anaerobic bacillus Clostridium botulinum, belonging to the neurotoxins class of compounds. It works by inhibiting the release of acetylcholine at the presynaptic membrane of cholinergic neurones that would otherwise transmit electrical messages from the brain to muscles signalling them to contract and move. The target muscle injected with β0ToxinA®, thus weakened and relaxed, cannot contract, so that the undesirable facial expression cannot be made, lines gradually smooth out from disuse, and new creases are prevented from forming. β0ToxinA® is used for cosmetic purposes to efface or reduce moderate to severe hyperfunctional (also called dynamic or hyperkinetic) lines and wrinkles from the face, deriving from corrugator and/or procerus muscles, such as glabellar or brow furrow frown lines, crow's feet, and horizontal lines of the forehead. As the use of botulinum toxin continues to expand, both in volume and in number of applications, β0ToxinA® has also been utilized to change the contour of the brows and eyelids, correct smile lines, fine wrinkles and creases around and at the corners of the mouth, and horizontal lines or cords around the neck. Also to shape chin, correct nasolabial folds, melomental folds and wrinkles, to shape and add volume to lips, and to improve facial asymmetry and nasal flare. Depending on the kind of skin, results are noticeable within a few days of receiving treatment, with thin, fair skin improving very quickly (usually in three days) and thicker, oilier skin taking a little longer (a week to ten days). The maximum benefit is reached in two weeks. The effects usually last between 3 and 6 months or sometimes longer depending on the individual. This is the time the nerve takes to recover and begin to release acetylcholine. After this period a gradual fading of effects is noticed, as the muscles may become overactive again. A new treatment can then be administered. Treatment with β0ToxinA® can typically be repeated indefinitely as acceptable safety in long-term treatment has been well established. Symptoms may vary throughout the course of the condition, and so the degree of relief and duration of effect varies from person to person. Yet the duration of benefit conferred by the first injection could provide a broad guideline to the patient as to the expected frequency of reinjection. The FDA, however, recommends that β0ToxinA® be injected no more frequently than once every three months. Clinical trials have shown that with repeated treatments, atrophy of the muscle may occur which usually produces longer-lasting results. Schedule the appointment early enough to allow time for the patient to fill out forms (a consent and disclaimer form) and consult with you or a member of your staff. Often patients, especially first-time ones, have questions and doubts, and need some time and talk to ease away their anxiety. Always take the time to learn enough about your patient's medical history, any allergies, problems, or conditions that would lead to potential complications. Make sure you know all the medications they are taking. You may also want to ask about their expectations of the outcome of the treatment. Remember to do this even with return patients, as changes and improvements following further treatments may be less dramatic than after the first injection. Remember that your patient has the right to know what is going to happen at any time, so explain exactly and step by step what you are going to do in a calm and reassuring tone. No anesthesia is required, although you may choose to numb the area about to be injected with an ice pack for just a minute or two before the injection to help minimize the pain associated with the injection. The use of an ice pack can also help reduce some of the potential bruising and swelling. Alternatively, an anesthetic cream may be applied. Explain that the whole procedure will take an average of 15 minutes, and never longer than half an hour, and that the discomfort associated with the injection is minimal and brief, resembling a pin prick. β0ToxinA® is a prescription-only treatment and should be administered carefully by a qualified medical practitioner or authorized cosmetic specialist skilled and familiar with it. Furthermore, a thorough knowledge of muscular anatomy of the forehead and periorbital regions is mandatory, just like proficiency at electromyographic amplifier technique. To reconstitute, β0ToxinA® should be diluted with sterile preservative-free physiological saline or β0ToxinA® Instant according to the dilution table below. The solid white product then dissolves into a transparent colourless to yellowish solution. One unit (U) of β0ToxinA® corresponds to 1 LD50 of (rodent) intraperitoneally-injected Botulinum Toxin Type A. Shake the vial very gently (to avoid possible loss of potency) after adding sterile physiological saline or β0ToxinA® Instant until completely dissolved, making sure that the reconstituted solution is clear and no particles are present in it before injecting it into the patient. The FDA recommends that the lowest effective dose should be used. Therefore especially patients without a prior history of tolerating botulinum toxin injections should receive a lower initial dose. Subsequent dosing should be optimized according to the patient's individual response. Keep in mind that the injecting volume into each muscle should not exceed 0.1 ml. In case of unsatisfactory response, a supplementary injection may be given. In case of relapse, the dose can be repeated or increased even at irregular intervals, but the maximum dose for each muscle should not exceed 5 U/injection. Up to 100 U can be evenly distributed in the chosen points. Carefully consider the patient's anatomy and goals when planning treatments. Ask the patient to frown, smile hard, close her/his eyes, or make any other movement or expression that may help you determine which muscles are used the most, and what are the best sites to inject β0ToxinA® keeping in mind that the location, size, and use of the muscles that create a furrowed brow vary markedly among individuals. It is up to you whether you mark with a pen the areas that need injecting, use an EMG machine to tell you the correct place to inject, or directly inject the sites that you have already agreed with the patient. Please note that precision and the correct injection technique is crucial to success. The area to be treated must be thoroughly disinfected. Make sure to inject only under sterile conditions, using a disposable syringe with a very small, fine needle. Before injecting, press on the bevel of the syringe until a drop is visible at the tip of the needle. The injection should be administered slowly in minute amounts into the dermis perpendicularly to the centre of the age wrinkle, about 1 mm from the bone, for a total of 4 to 16 points of injection for the whole visum. The approved indication states that Botulinum toxin type A can be used "to treat and temporarily improve the appearance of glabellar lines" and therefore injected between the eyebrows. Further studies and cosmetic practice shows that β0ToxinA® can be safely and successfully injecting into other areas of the face. However, appropriate muscle selection can be difficult as individual variance is great, and even within the same patient, when proceeding the treatment with further injections, you may encounter changing pattern of muscle involvement and progression of the disorder. Therefore β0ToxinA® treatment requires thorough anatomical knowledge, skill, and sensitivity. Remember to always consider the complex interplay among facial muscle groups to adjust the muscular balance and achieve an aesthetically pleasing and natural-looking result. 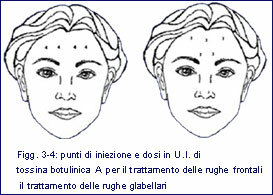 The frown vertical lines between the eyebrows and on the bridge of the nose form the glabellar "frown" complex. They can be deep furrows that give a worried or angry look produced by four muscles: corrugator, procerus, orbicularis oculi and suppressor supercilii. Injections should be administered intramusculary inside the lines in 4 or 5 sites, in doses of 4 U each, for a total of 16 to 20 U.
Squint lines or periorbital "crow's feet" at the corners of the eyes, also called laugh lines, are caused by sun exposure, but also laughing, smiling, and cigarette smoke. The muscles involved are: orbicularis oculi (vertically oriented), and elevator and retractor of the mouth corner. Injection sites: in the crow's feet at the sides of the eyes, 1-1.5 cm lateral to the lateral canthus, then 1.5-2 U 1 cm apart along the orbital rim only as far as the midpupillary line to avoid ectropion. Make sure you inject outside the bony orbital to avoid diplopia. Injections should be administered subcutaneously, inside the lines in 3 or 5 sites, in doses of 1.5-4 U each, for a total of 7.5 to 14 U. The horizontal lines across the forehead are caused by the anterior frontalis portion of the occipito frontalis muscle, the only one that can lift brows. Injections should be administered horizontally between the brows, a few centimeters (3-4) above them. 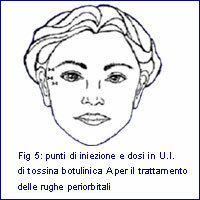 Take care not to inject in the 2 cm zone above the eyebrows to avoid brow ptosis. Injections should be administered subcutaneously, inside the lines in 5-10 sites, in doses of 2.5-4 U each, for a total of 15 to 25 U. Special care should be taken in this case to avoid the expressionless "forehead Botox look" as a result. A complete block of the forehead (the entire frontalis muscle) should not be attempted and other muscles like those needed to raise the eyebrows should not be affected in order to maintain a natural expression, with animation and movement of the brows. A more recent, yet very successful, β0ToxinA® achievement, is the browlift. As people age, they have more redundancy in the upper eyelid, which gives their faces a tired, aged look. We can elevate the brows laterally by 2-3mm by relaxing muscle fibers that pull down on the outer side of the brow. That is usually enough, except for severe blepharochalasis cases. Four muscles are involved: corrugator superciliaris, orbicularis oculi, procerus, and depressor superciliis. 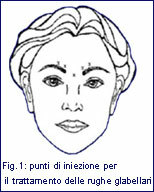 To identify the correct injection points, have your patient lift her/his brows maximally to identify the temporal fusion area where the frontalis ends. Then have her/him close her/his eyes maximally to locate the site of orbicularis oculi maximal lateral brow pull inward and downward. Injections should be administered subcutaneously in 4 sites, just inferior to the point of maximal pull inward and downward of the orbicularis oculi, in doses of 2 U each, at a distance of 2 cm one from the other, for a total of 4-6 U per side for women and 6-10 for men. Special care should be taken to ensure that you inject far enough away from the frontalis. Too-medial injections can diffuse to the orbital septum area and lead to eyelid ptosis. Too-superior-medial injections can diffuse up to the frontalis and result in lateral brow drop and eyebrow ptosis. Good results have been obtained treating the lines of aging or skin folds on the sides of the chin and in front of the jowls caused by the presence of a ligament between the skin in this area and underlying deeper structures. As adjacent skin descends with aging, the skin directly over the ligament stays in place, creating this fold. Carefully inject 3-5 U per side in the depressor anguli oris, in the jaw rim, where it meets the ideal line joining the side of the nose with the corner of the mouth. A new frontier of β0ToxinA® treatment is to contour and shape the mouth. By carefully injecting the depressor anguli oris, you can potentiate the opposing action of the zygomaticus major and minor muscles to elevate the corners of the mouth, in this way reversing some people's perpetually frowning expression caused by a downward oral commissure angle. In this case as well, precision is paramount. To find the appropriate injection point, the orbicularis oris muscle, have your patient purse her/his lips. Then, depending on the case, inject 6 to 10 U into the muscle, staying medial, and avoiding injecting within 1.5 cm of the oral commissure. Too-lateral injections can weaken the lip elevators, causing drooping and drooling, while midline injections can flatten the Cupid's bow. β0ToxinA® can also rejuvenate the upper lip area, often marked by fine vertical lines. Special care must be taken as, injecting the so called "smoker's lines", useful muscles may be affected, and the patient may not be able to smile, purse her/his lips, whistle, drink from a straw, and pronounce the letters P and B. The secret is to inject only infinitesimal amounts (about 1 U) and keep an eye on symmetry. The muscle bands that run the length of the neck (platysma) commonly known as "turkey neck" are another area that is being experimented with by doctors. Excellent results have been achieved, although special care must be taken here in injecting β0ToxinA® very superficially, so much that the liquid injected must show like a little bump under the skin. Injecting too deeply may result in difficulty swallowing, speaking, or breathing. Injections should be administered in the front bands, starting 2.5-4 cm from the jaw, 2-3 cm apart, for a total of 3-4, and a maximum of 6 U per side. A short period of observation is recommended for patients having just received β0ToxinA® therapy. No recovery time is needed. Any redness that may result from the procedure at the site of each injection may be minimize by applying some Facial Powder, while any immediate bruising may be camouflaged with a touch of Liquid Concealer. The patient may resume normal activity immediately with minimal restrictions. She/he is only required not to touch, massage or rub the treated area for 12 hours after the injections as this may cause the toxin to spread beyond the treated area. It is also crucial that she/he keep her/his head upright and does not lie down for 4 hours after injection (no naps, exercising, bending down�). Also, they should avoid exposure to sunlight, or extreme temperatures (solarium, sauna, high mountains). However, the use of sunglasses for the first few days is highly advisable. Using many facial expressions for the first day helps to work β0ToxinA® into the muscles, and should therefore be encouraged. β0ToxinA® should not be used in the presence of infection at the proposed site of injection and in individuals with anaphylactic tendency and known hypersensitivity to any of its ingredients. It should not be administered to pregnant or breast-feeding women and children below 12 years of age as trials on these groups are still few. It is also contraindicated in patients suffering from eyebrow hyperplasia and neurological disorders such as ALS, myasthenia gravis, or Eaton-Lambert syndrome, as they may suffer severe side effects. It is ineffective in patients with serious muscle fibre contracture. The injection should be postponed in patients who have a fever or acute infectious diseases. The utmost care should be taken with patients with blood, heart, liver, or lung diseases, or active tuberculosis; and those who have experienced problems with injections, who have muscle, swallowing, or breathing problems, or have had surgery or injury in the head. Side effects are usually very minor and typically local. Tenderness, bruising, temporary swelling, or mild pain at the injection site for a day or two is the most common complication, especially when the eyes and forehead have been treated. Patients who use aspirin, other non-steroidal anti-inflammatory drugs, or anti-coagulants are at higher risk for bruising and should avoid these medications for a few days before the treatment. Less frequent side effects, especially when the forehead is treated, are: headache, respiratory infection, flu-like symptoms, nausea. In rare instances, β0ToxinA® can spread into neighbouring muscles and cause temporary paralysis of adjacent muscles such as eyebrow or eyelids resulting in ptosis, a drooping of the eyelid, drawback of the lower eyelid, reduced blinking, incomplete closing of the eyelid, weakness of facial muscles. However, all such symptoms disappear spontaneously within 3 to 8 weeks. Temporary and different degree of ptosis of the eyelid, vertical deviation and rarely mydriasis, related to the diffusion of the toxin to the muscles adjacent to the eye, may occur in some patients who receive β0ToxinA® therapy near the eye; however, all such symptoms disappear spontaneously within 3 to 8 weeks. Prescription eye drops like Iopidine may help improve this while you wait for the side effect to wear off. β0ToxinA® can block neuromuscular conduction by inhibiting the release of acetylcholine and therefore can cause local muscle flaccid paralysis. Double vision is very rare and can, like any other side effect, last 6 months at a maximum, that is as long as the toxin stays in the body. Most of these adverse reactions can be avoided by proper injection technique (accurate choice of injection site, injecting not too deeply, using a lower dose). Serious and/or immediate hypersensitivity reactions have been rarely reported. These reactions include anaphylaxis, urticaria, soft tissue edema, and dyspnea. If such a reaction occurs, further β0ToxinA® treatment should be discontinued and appropriate medical therapy immediately instituted. The fact that β0ToxinA® is a neurotoxin should not be overlooked. A β0ToxinA® treatment must therefore be treated as a medical procedure and only administered under careful medical supervision. β0ToxinA® should not be injected more frequently than once every three months, and the lowest effective dose should be used. 1:1000 adrenaline should be prepared in case of accident. It is important to keep in mind that, with us, you have the unique opportunity of neutralizing any adverse reactions, both right after the injection, or some time later as we are the only pharmaceutical firm dealing with botulinum toxin type A producing also an antidote to it, "Anti β0ToxinA®". The effects of β0ToxinA® may be potentiated by the use of certain antibiotics (such as aminoglycosides - e.g. Gentamycin) or other drugs interfering with neuromuscular transmission (e.g., curare-like compounds) and therefore should not be administered while under such therapy. According to the tests on immunogenicity performed, the body may in some cases react to the proteins contained in the Botulinum toxins by forming antibodies. And when such antibodies are formed, the effect may be that one is no longer able to respond to the therapy. Such event is rare as β0ToxinA® contains a minimal amount of neurotoxin complex proteins. However, it is recommended that you start with a smaller amount and then increase to a larger dose, and that the treatment is not administered more frequently than once every three months. Professor Lowe has pointed out in his book "Skin Secrets" that a very small percentage of first-time patients are resistant to Botulinum Toxin Type A. That is probably due to the fact that they have unknowingly had a slight bout of botulism leaving them with antibodies to it. Maximum solution temperature is 36°C. The reconstituted β0ToxinA® should be used at once or stored in the refrigerator at 2 to 8 °C and be used within 4 hours as it does not contain a preservative. The vial and the syringe used in the administration of the drug as well as any residual β0ToxinA® solution should be disposed of after sterilization according to standard medical waste practices. 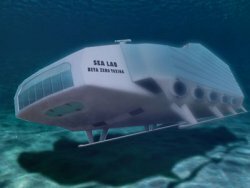 The results show that freeze-dried β0ToxinA® will keep its efficiency at room temperature for one week, with a little drop in efficiency for 10 days, and a 15˜20% drop in efficiency for 3˜12 months. β0ToxinA® shelf life is of 3 years from the date of freeze-drying in correct storage conditions, that is at a temperature of -5 to -20°C. Like any other medication, it must not be used after the expiration date stamped on the vial. therapy.